When I launched techese, I had been yearning to get away from the likes of WordPress. I had settled on Squarespace back then and have been with it ever since. I still wholeheartedly recommend Squarespace to folks who ask me what they should use to create a site. One thing I have always had issue with was their iOS app. It wasn't all that good back on Squarespace 5, and since Squarespace 6, it has been a bag of hurt. Thankfully, Squarespace has released two new apps to handle the crowded functions of the previous app. Blog handles the writing and posting part while Metrics handles all your stats. Both apps are gorgeous and work really well. These were worth the wait. I'm really happy that Markdown is a first-class citizen in the Blog app. I have two issues which will hopefully be taken care of in updates. The first is that the Blog app is missing the social sharing toggles of the web interface. If it had those, I could truly do everything I wanted with posting from iOS, which would rock. The second issue is that Metrics doesn't have an iPad UI, so it scales up in the ugly 2x mode. Beyond those two omissions, the apps work great, are fast, and chock full of the feature set you would expect. I hope Squarespace treats these apps as first class, iterating often, instead of letting them languish as the previous app did for so long. Ever since Iconfactory released a long awaited rewrite to Twitterrific last year, they have been hard at work on bringing the classiest Twitter app out there to being extremely powerful. Today’s 5.2 update to Twitterrific features Push Notifications. You can receive notifications for Direct Mentions, Replies, Mentions, Favorites, Retweets, and Follows. They even have fantastic little color symbols that show in the notification itself, which I have found handy to know the type of message at a glance. Right now Iconfactory is launching Push as a beta, with only the first 1000 accounts gaining access today, though they will be rolling out availability over the next couple weeks. This is being done to ensure their servers are able to handle the load. If you weren’t able to activate push yet, try again the next day to see if you can. Once your account is enabled, it can be enabled on any other number of devices. There are all sorts of other updates in 5.2. A couple other new features are profiles now show Twitter’s banner images (and look great!) and discussions can be shared via email or Storify. Some of the improvements are that the timeline can now show 600 tweets at a time up from 400, improvements to username autocomplete, and the load more button now animates as loads, along with a laundry list of other improvements and fixes. 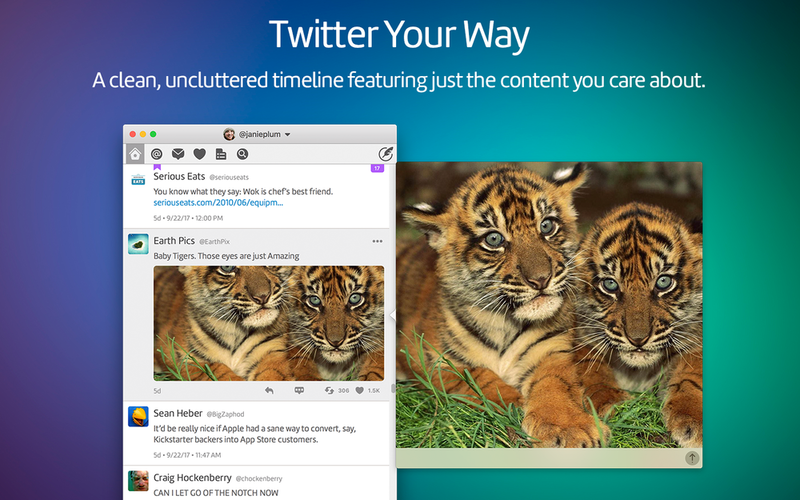 If you are looking for the friendliest Twitter client out there, you need Twitterrific. Everyone’s favorite blue bird costs just $2.99 in the App Store. A couple years ago Apple live-streamed a couple of their events, which was amazingly awesome. Then they stopped — until now. Today at 10:00 am PDT, you can watch the Apple Event live from an iPhone, iPod touch, iPad, or a web browser or you can watch on a special Apple Event channel that appeared on Apple TVs all over this morning. (You may need to reboot the Apple TV to see the channel appear). I’m glad to see the return of live-streaming, and I’m pretty thankful to be a remote worker from home. Neil Armstrong, the first man to walk on the moon, passed away at age 82 today. Thanks you, Mr. Armstrong, for your work in forwarding space travel; for uniting not only a nation, but a planet; and for giving the creative and fascinating minds of children something to dream about. I am a huge fan of Square. I use it to accept payments. My wife uses it to accept payments. I use their amazing Pay with Square app to buy coffee at my favroite coffee shop. Even though I have become a bit snobbish about my coffee in the past year, Starbucks helped me to have an interest in the caffeinated beverage. And I still like Starbucks every now and then, because they were integral into kicking off this little area of my life that I take a little pride in. I still like to go and sit at a Starbucks every now and then, and when I am on the road, I know I can get a fairly decent brew there. This is huge and exciting. I think this is going to be a fantastic partnership for both companies, and I hope more people and businesses sign up for Square.